Pain Physicians NY (Brooklyn, Queens, Manhattan, Bronx NY) is one of the first practices in New York to offer an alternative neck pain relief treatment. Depending on severity of the direct Impact Injuries we might offer Platelet Rich Plasma (PRP) injections, Interstitial Laser Therapy, Pulse Stimulation Treatment (P-STIM), Electrical Nerve Stimulation therapy. Our Brooklyn neck pain specialists are best in region. We were selected to be a part of the international medical team for the Rio Olympic Games. The human body can withstand some impact imposed on it, but when the impact is targeted directly, it can be difficult to do so. Such injuries are referred to as direct impact injuries or blunt trauma and are often experienced in sports, physical attacks, and other outdoor activities. The neck is particularly at risk of such impact injuries because it does not have any protection. Other major bones in the body usually have a mass of muscles surrounding them and they usually absorb most of the impact. The neck, however, is exposed and only has a thin layer of neck muscle to protect it. This reduced mass of muscles was meant to allow for movement of the head, but it also leaves the neck at risk of an injury and subsequently of neck pain. This happens when the head is moved suddenly, causing the ligaments and tendons in the neck to overstretch. The ligaments are responsible for keeping the cervical spine together while the tendons allow for limited stretching and movement. When the head is suddenly moved backwards, forwards or sideways due to an accident, for example, these tissues become irritated and can lead to neck pain. Neck pain due to whiplash is usually experienced a few hours after the injury and will usually heal on its own with time. However, painkillers and NSAIDs may be prescribed to help relieve the pain experienced. The same tendons and ligaments in the neck can be irritated by being forced into an uncomfortable position for a long time. During sleep, for example, the individual may lie in an awkward position that either squeezes or overstretches the tendons, leading to irritation. Neck pain is subsequently experienced whenever the individual tries to move their neck and is thus forced into a fixed neck position. Relief for neck pain primarily involves relieving the pain using painkillers and also relieving the inflammation through cold compresses with ice. Prevention measures involve changing posture to avoid a repetition of the same problem. Cervical radiculopathy refers to a number of problems that affect the cervical nerves in the neck. 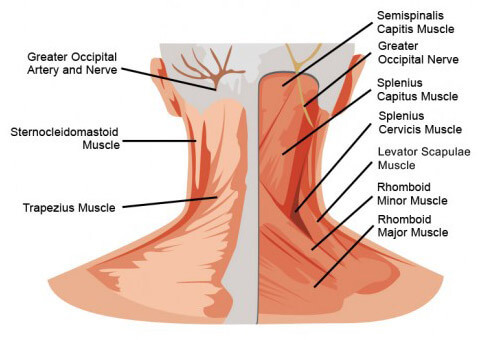 The cervical nerves originate from the neck and radiate to the arms and upper abdomen. Due to direct impact, these nerves may become ‘pinched’ due to a fracture in the vertebrae which presses upon them. Treatment often involves pain relievers, but if the problem is severe, the condition may call for surgery to reconstruct the cervical vertebrae. Before a treatment plan is implemented, it is important to determine the extent of damage caused by the direct impact injury to the neck. X-ray and MRI technologies are used to examine the cervical vertebrae and identify the damage. Direct impact injuries to the neck often cause fractures or dislocation to the neck, which can either be managed through physical therapy or neck braces. It is important to address the problem earlier on because, if left untreated, the vertebrae could become damaged even further, leading to permanent damage. Surgical therapy is the last treatment option when other methods have failed to relieve and control the signs and symptoms of neck pain as a result of a direct impact injuries. The most advanced pain management center, best rated neck pain specialists and doctors at Pain Physicians NY offer unique, individualized approach. We are using the most effective neck pain treatment options utilizing the latest technologies available in USA.